Does Speckle Works work on Rhino 5 (64 Bits)? 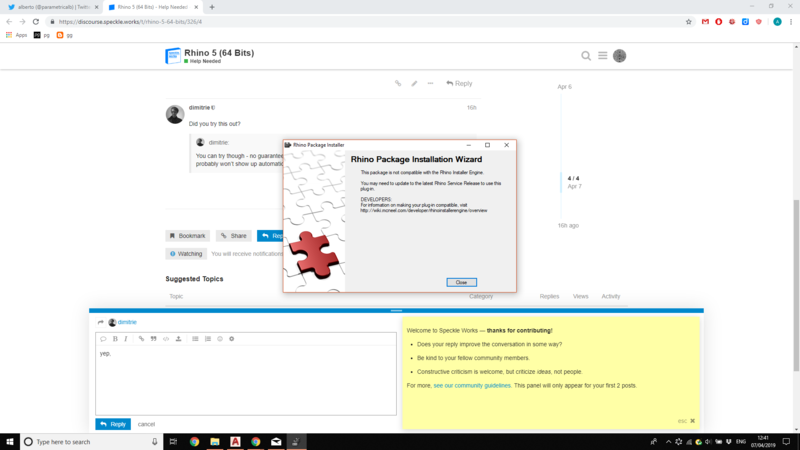 We’ve unfortunately stopped supporting rhino 5, as it was too much effort to test properly, and was thus causing more trouble than it was worth. You can try though - no guarantee of what happens - to use the .rhi file provided here. The panel probably won’t show up automatically, but there should be a SpecklePanel command that toggles it. Any chance there is an older unsupported version to play with? Or it just won’t work? Did you try this out? yep but it won’t work. Thank you anyway!